On 1 December 2014, I was privileged to give the graduation address for our departing students – Master’s graduates and several PhDs. 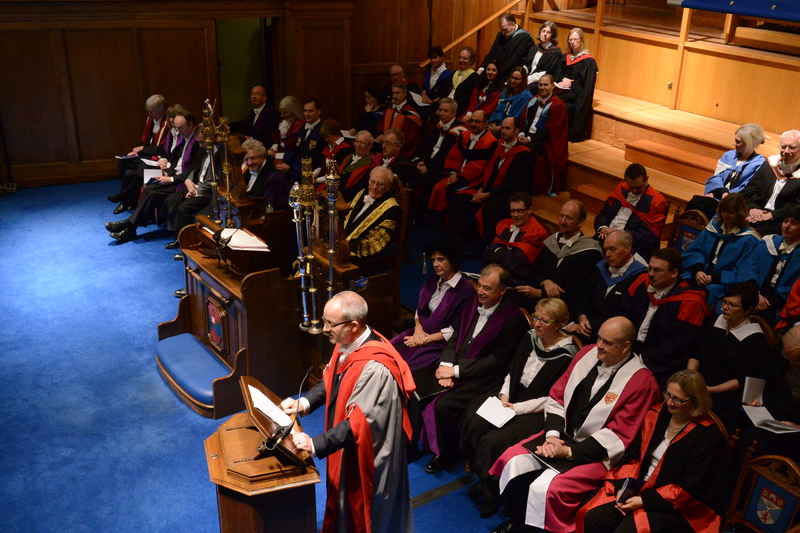 The ceremony took place in the Younger Hall of the University of St Andrews and was streamed live to to watching parents, families, and friends all over the world. ‘Chancellor, ladies and gentlemen, and most of all new graduates. It is a universal human failing to want to have the last word, and I am as culpable as anyone. So what a pleasure and a privilege it is to stand at this lectern and offer you the last words you will hear in your university career, or at least, in this part of it. And as with so much that you will have heard over the last year, or years, I imagine that you are only half listening; the chairs are becoming uncomfortable, the hall stuffy, and your robes hot. You are looking forward to stepping into the December cold, to processing down North Street and into the Quad, to this final rite of passage and of parting. Many of you, parents and students alike, have travelled from all over the globe to attend this ceremony. Parents and families, I thank you. Thank you for travelling here today to see your children, siblings and friends graduate. I hope that you have a splendid, happy day and that you are not disappointed by the gaudy, mediaeval spectacle of graduation at this historic university. More than that, I thank you for the support and encouragement that you have given to those who are graduating today. I’m sure that much of what is being celebrated here could not have been achieved without you. New graduates, you too have travelled a long way to be here. But it cannot have escaped your notice that you have been on a much more important journey, one of growing, learning, and developing. You are no longer those nervous souls who arrived in St Andrews not so long ago. You have learned so much, and not just from books and lectures. You now know, for example, how it feels to charge into the North Sea at dawn on May Day – a sensation of which I, and I suspect many others on the stage behind me, remain blissfully ignorant. You have come to know the ancient stones of this unique city, famous for having not one, not two, but three streets. And you understand the quiet satisfaction of living in a town where the last exciting thing to happen was the castle siege in 1546. You have made friends, building relationships with others that will sustain you through your adult lives. Some of you will have met partners who will keep you company for the rest of your days. These are not the fragile friendships of casual acquaintance, but deep bonds of reciprocity, strong enough to ride out whatever bumps life may throw at you, generous enough to celebrate successes and triumphs joyfully and without envy. Today might be the last time you see a friend for many years, but you can be sure that the friendships you have formed here will transcend time and place. Metaphors of journey come naturally to graduation and to St Andrews. According to legends of the town’s founding, St Rule was instructed to carry the bones of St Andrew to the end of the earth. I like to imagine the saint arriving, one cold, foggy night, staking his claim and giving thanks that he had finished his wearisome travels. History does not record what he said when the sun rose over Dundee the following morning. As St Rule would have been painfully aware, journeys are hard work. Travel is much more fun after the fact. Beneath your still-fresh recollections of bonfires on the beach and endless blue summer evenings there are shadows of December exams and nine o’clock lectures in February. A collective shudder runs round the hall as you remember those teachers who challenged your intellects, discomfited your comforts, and unsettled your assumptions. It wasn’t always easy, but you coped, grew, progressed, and now you are passing on, setting out into the next stage of life. Do not forget what you have learned here. We have taught you to think critically and responsibly. Reflect for a moment, and recognise that you have been blessed with talent, opportunity, and education; gifts of nature, of chance, and indeed, of the generosity of those who have helped you along the way, many of whom have come to see you graduate. It’s good to be fortunate, and today you celebrate just that. I ask one only thing: that you, who have so much opportunity and possibility ahead, make the best of what you have been given. Do not forget those who are less fortunate. You have studied Management and International Relations. I ask that you, when the time comes, manage thoughtfully and with empathy, organise for flourishing and fulfilment, and work to build a polity worthy of future generations. Students have been graduating in this University for six centuries. Such history bestows great responsibilities, and you cannot wear it lightly. I’m sure you are up to the task.